President Donald Trump, right, shakes hands with Prime Minister Justin Trudeau, Canada's prime minister at the White House back in February. They will meet again Oct. 11. 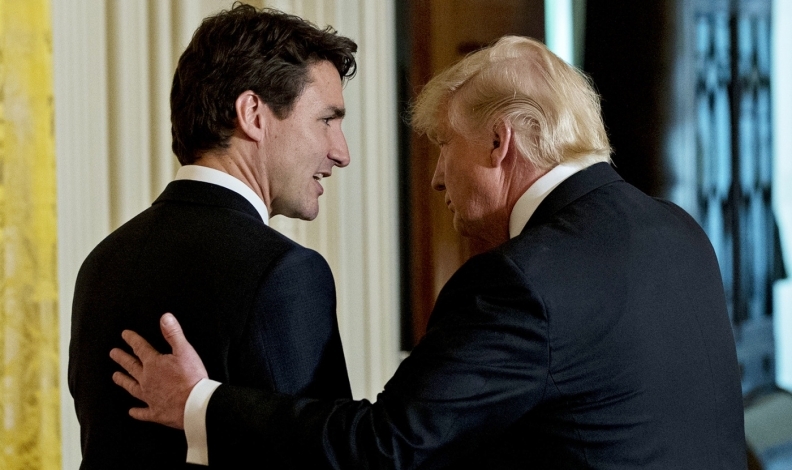 President Donald Trump renewed his threat to walk away from the North American Free Trade Agreement just as Prime Minister Justin Trudeau arrives in Washington on the eve of a new round of negotiations. Trump told Forbes, in an interview published Tuesday, he thinks NAFTA will have to be terminated — as signals mount the United States is putting potentially deal-breaking proposals on the table and as the top U.S. business group sounds the alarm. The U.S. Chamber of Commerce, for example, described some of Washington’s NAFTA demands as “poison pill proposals” that could doom the pact. The fourth round of talks resume Wednesday in Washington. The United States is expected to detail a proposal for the auto sector that would raise the minimum content requirement for parts sourced in the NAFTA region and in the United States specifically. “I happen to think that NAFTA will have to be terminated if we’re going to make it good. Otherwise, I believe you can’t negotiate a good deal,” Trump said in the Forbes interview. He said he considered it a “great accomplishment” to pull out of the Trans-Pacific Partnership trade pact, which included the three NAFTA countries, and that he favours bilateral pacts. On Tuesday evening, Trudeau is scheduled to attend the Fortune Most Powerful Women gala that Ivanka Trump may also attend. The next day, the prime minister visits the White House for meetings with Trump — with no joint press conference scheduled — after he and his foreign minister, Chrystia Freeland, speak with members of the U.S. House Committee on Ways and Means. Trudeau will hold a press conference on his own after he meets with Trump. While Trump has regularly targeted the U.S. trade deficit with Mexico in renegotiating the deal, tensions are rising with Canada, the top buyer of U.S. exports. The United States imposed duties on Canadian manufacturer Bombardier after a trade challenge filed by U.S. plane-maker Boeing Co. Trudeau and U.K. Prime Minister Theresa May have called on Trump to intervene. Freeland, a former trade minister appointed to her role this year primarily to deal with NAFTA talks, has begun to issue warnings and temper expectations, saying in a television interview this weekend the Trump administration is the most protectionist since the 1930s. NAFTA talks are scheduled to run Oct. 11 to Oct. 15 in Washington. Speaking there on Tuesday, Freeland declined to predict what NAFTA will look like in the future and reiterated Canada believes in free trade. Trump administration officials have said they want a deal by December, a timeline that observers say is increasingly unlikely. Mexican Economy Minister Ildefonso Guajardo said last week he wants a deal by the end of Spring 2018. Mexican Presidential elections and U.S. mid-term elections scheduled for next year threaten to add to tensions in negotiations. Trump can withdraw the U.S. from the deal after giving Canada and Mexico six months’ notice, though experts debate whether the president would require congressional approval. Trudeau is scheduled to visit Mexico City on Oct. 12 and 13 after his two-day Washington trip. it’s his first official visit to Mexico, with Trudeau’s office saying he and President Enrique Pena Nieto will discuss trade issues.